Yesterday, I took part in the Alberta Time Trial Provincial Championships. It was not really on my race calender and more a spontaneous idea to test and see where I am with my training. The moment I signed up for it, I knew it will be hard especially because my legs are very fatigued from the training program I am on (see previous post). That being said, I mentally prepared myself to only treat this race as a hard training session in which my goal was to hold 360 watts steady over the 38km. Since my theoretical functional threshold power (FTP) was 353 watts (see here), I thought it might be possible even though my legs are pretty tired. So, I chiselled 360 watts in my mind and was only thinking about this, ignoring the other competitors and also ignoring other aerodynamic benefits such as racing wheels etc. Essentially, I rode my bike in a training set-up but with an aero helmet. The race course was nice and relatively flat with only a few turns. So, a perfect location for power testing. During the race I felt very strong and was pushing close to 400 watts consistently. I knew I was riding above my theoretical FTP and was hoping I will be able to hold this pace all the way. After the turnaround point, it started to feel a little bit harder and it definitely took more effort to keep the watts high. 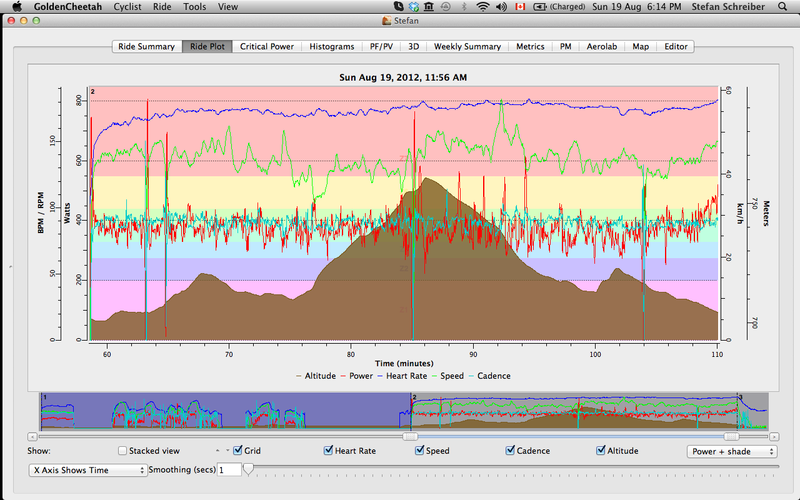 During the last 2 km, I was able to stay above 400 watts and I knew I would have met my goal to average 360 watts. In the end Brian came in first (pretty awesome performance from this guy), second was Josh (strong as always) and I finished third. It kind of reminded me of the Devon Grand Prix in which the three of us finished in the same manner. New functional threshold power: 367 watts, which represents an increase of 14 watts! Thanks to Jesper Bondo Medhus! Your training plan is working well! With this results I am very motivated to hit the last week of hard training before next weeks down week (which I am really looking forward to). Then, I will have another 2 weeks of hard training before I start tapering (or peaking, a term which I like better). Yes, I am almost there! Kona is around the corner! !